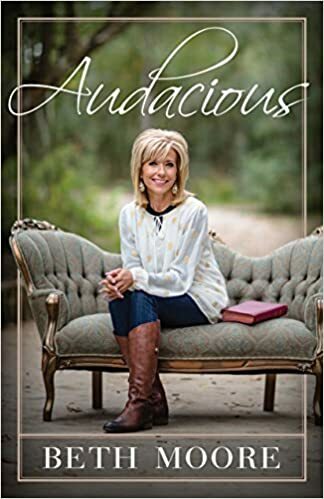 Soap Box Review of, “Audacious” from Beth Moore. As most of you know, I am a bit biased due to Moore’s sloppy ecumenism and claims of extra-biblical personal revelation. (some of that she has attempted to correct.) That being said, I am not on a witch hunt, and I am not a heresy hunter. I don’t run a discernment ministry site. I simply review Christian books and Bibles, so people can make informed decisions before laying down their hard won sheckles. I could easily dismiss her book as a simple edit of her, “vision statement.” She basically has just added two words to her old vision statement, and contrived a book around it. Instead, I decided not to discount her offering based on my bias. I should also let you know that I am not the target audience for a book like this. I prefer more specific language and less color when reading a theological book. Before you get upset at me stating that her book is theological, perhaps you should consider that any study or writing about God is considered theological. There are feelers and there are thinkers, and I’m not saying that these two groups are mutually exclusive. There is a spectrum, and we all think and feel. Some of us are predominantly motivated by reason and thought, where others are moved more by emotions and feelings. I am in the first category. That, along with being a fortyfour year old male, and a Reformed Baptist, is why I am not the target audience. If you are a woman who likes to get into someone’s personal life, thoughts, emotions, history, and you want to have a little information about God sprinkled in, then you are the target audience. Feelers, aren’t so persnickety about precise language. They understand the intent of the author who paints with their colors. People who are on the other end of the spectrum, are concerned that the wrong ideas will be conveyed if the language is not precise. We don’t want to be responsible for someone falling into heresy. Our motto is, “If you can’t improve on the silence, then don’t say anything.” In regards to theology it looks more like, “The Bible says it better, just read and quote the Bible. If you must write a book, be sure that you are faithfully, accurately, and truthfully, expositing the word of God in a beneficial manner that edifies, and educates, the reader.” If you aren’t doing that, stop writing. Beth Moore’s book takes 178 pages to express the Shema, or the Greatest Commandment of God’s word, and what could be said in one short blog article. I would be glad to read 200 pages or more dealing with this topic if each sentence were valuable. Moore’s book had very little of value to me. She writes 178 pages by pumping up the word count, adding all of her quiche Mooreisms, out of context, sometimes misapplied scriptures, personal stories, and wordsmithing. She does all of this without adding that much quality content. It is a piece of fluff. Some people may be encouraged by it if they care about all of Moore’s stories. On the other hand, if you want to learn about God, instead of Moore’s books, there are plenty of other worthwhile books to invest your time in. It was a painful for me to push through and read. I would have liked to have had a strainer to filter out the sound little tidbits, and discard the copious amounts of page filler. This is my personal experience with her work. If you enjoy her style then you will like this book as it seems to be more of the same. 978-14336905259781433690525AudaciousBeth Moore's AudaciousBob SnyderISBN-13: 978-1433690525reviewSnyderSnyder's Soapboxsnyderssoapbox.comSoap Box Review of, “Audacious” from Beth Moore. Power in the Blood, or the Shedding of it? Magnificent! If only church Bible study groups would pick another author, she might just fade away. Thanks for being truthful. I think publishers believe that women couldn’t possibly be interested in theology… They also treat teens like they are stupid. It is a disrespect that should be countered with responsible purchasing.